Since ancient past India has had an unbroken tradition of being the fountainhead of spiritual knowledge in the world. Great seers, masters and incarnations have been born here to spread the true knowledge from time to time. The Sanskrit word "Bodh" literally means knowledge. Buddha thus means "The one who has attained all knowledge". The cessation of conflicts at both the internal the external levels is possible only when one is armed with the right knowledge. Once the conflicts recede, peace blooms and one attains bliss. There are four principal Buddhist temples sites or Buddha temple (as they are known) across India that attract Buddhist pilgrims from all over. The most important of these are located primarily in the Ganges Valley of India. This is where Prince Gautama attained enlightenment under the sacred Asvatta tree (Bodhi tree) and became known as Lord Budha. This is one of the four most sacred pilgrimage places for the Buddhists. The other three important places are his place of birth at Lumbini, Nepal; the site of his first lecture at Sarnath, near Varanasi; and the place where he left his body at Kushinagar, near Gorakhpur. Buddhists from all over the world have built temples here in Bodh Gaya. The Dalai Lama often spends time here. Tibetan pilgrims come here for the winter from Dharamshala. Bodh Gaya is located about 13 km from Gaya, 450 km west of Calcutta, and 90 km south of Patna. Kaushambi, in Uttar Pradesh, was visited by Buddha in the 6th and 9th years after his enlightenment. He delivered several sermons here, elevating it to a center of learning for Buddhists. Today one can see the ruins of an Ashokan Pillar, an old fort and the Ghositaram Monastery. The archaeological excavations here have yielded a large number of sculptures and figurines, coins, punch-marked and cast coins and terra-cotta sculptures which show the reverence the city was held in by the devout, in times gone by. All these religious finds of historical and archaeological importance can be viewed at the Allahabad Museum. Situated in the North Indian state of Uttar Pradesh, 51 km off Gorakhpur. Is one of the principal centers of Buddhist pilgrimage is the place of Mahaparinrvana. The monument of Kushinagar are situated in three distinct comprising in the main site of the Nirvana Temple houses over 6meter long statue of the reclining Buddha The image was unearthed during the excavations in 1876. Located in the flat plains of South-Western Nepal and the foothills of Churia range is kind of holy sentiment to the millions of Buddhists all over the world-as do the Jerusalem to Christians and Mecca to Muslims. Lumbini is the place Lord Buddha -the apostle of peace and the light of Asia was born in 623 B. C.
This contains the ruins of the world's oldest university. This was also a place where the Buddha and Mahavira stayed and preached. The remains of 11 monasteries and several Chaityas, built over a period of time, in red brick stone have been excavated, as well as a large stairway, a library, lecture halls, dormitories, cells, ovens and wells. Buildings were multi-storied and multi-tiered, built on massive terraces of solid brick, decorated with Buddhist and Hindu divinities and warriors, dancers, musicians, animals and birds. A sacred place for both the Buddhists and Jains. There is Gridhakuta, where the Buddha, converted a Magadhan King. Also worth visiting is Saptaparni Cave, where the first Buddhist council was held. The Pippala Stone House or Machan is a huge structure, with cells around it. At Maniyar Math is an old Jain Shrine. Then there is Venuvara, the bamboo grove, where the Buddha meditated. The Jivakamanana Monastery is of interest, since it was one of the Buddha's favourite retreat. Situated 10 km from Varanasi is the site where Buddha delivered his first sermon to his five disciples, preaching the middle path for attaining 'Nirvana'. Realising the sanctity of the site, emperor Ashoka, in the 3rd century B.C. built some of the finest monuments and legacies. Another of the most commonly visited places of Buddhist pilgrimage is Shravasti. It is here that the Buddha is said to have performed great miracles. One story tells of how on throwing down the seed of a mango, a great mango tree instantly arose. Another story tells of how the Buddha stood in the air, the lower part of his body engulfed in flames, with five hundred jets of water streaming from the top of his body. Vaishali was one of the Buddha's favourite resorts and he visited it on several occasions It was here that he had his famous encounter with the prostitute Ambapali, the incident is recounted in the Mahaparinibbana Sutta in The Long Discourses. Another discourse he delivered here is the long but interesting Mahasihanada Sutta from The Middle Length Discourses. According to the Mahayana tradition the famous Vimalakirtinedesa Sutra was preached here too. The 'DHANKAR GOMPA' casts its subtle spell upon a person. Anyone, who visits it, finds himself unable to forget this place. 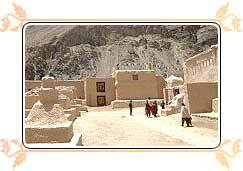 It is about 25-km east of Kaza and serving eastern part of central Spiti. Dhankar is a big village and erstwhile capital of Spiti King. Dhankar means " a place in the mountains unreachable for strangers" and which is home to another monastery associated with the Great Translator, Rinchen Zanggpo. A 24-km drive from Gangtok, through the beautiful, bewitching countryside leads one to Rumtek. Rumtek, is the seat of the Karmapa Lama who heads the Kagyupa Sect of Buddhism. Tankhas (also spelt as Thangkas) and frescoes decorate the walls of this ancient monastery, now renovated. His holiness Gyalwa Karmapa was the 16th reincarnate. The style of the monastery, strictly traditional has been patterned on the lines of the Lamas series of Tibet. 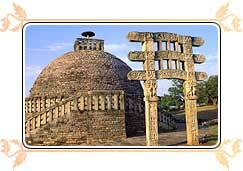 Located on the foot of a hill- Sanchi is just 46 kms Bhopal. It is more of a village than a town. Sanchi is a religious place with historical and Archaeological significance. Sanchi is a site for the numerous stupas which were built on a hill top. The place is related to Buddhism but not directly to the life of Buddha. It is more related to Ashoka than to Buddha. Ashoka built the first stupa that are a brilliant example of Buddhist temple architecture and put up many pillars here. The crown of famous Ashoka pillars, with four lions standing back to back, has been adopted as the national emblem of India. These are the caves that the followers of Lord Buddha, embellished with architectural details with a skilful command of the hammer over the chisel, with sculpture of highest craftsmanship and above all, with the paintings of infinite charm. The entire course of the evolution of Buddhist architecture can be traced in Ajanta & Ellora Caves.